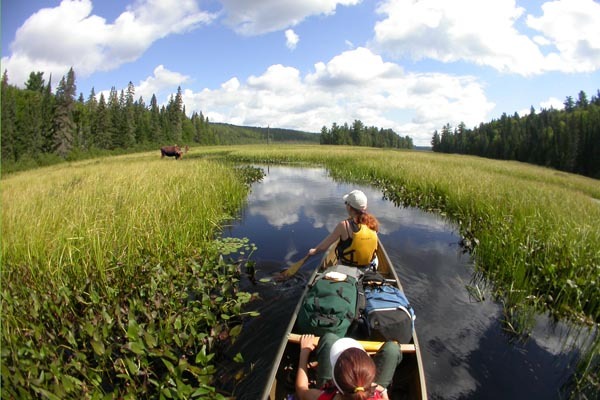 Algonquin Park in Ontario’s interior, presents a natural wilderness beauty at its very best. We will be traveling through many beautiful lakes using light weight canoes and short easy portages. Different campsites along the way give us opportunity to sample the nuances of this rich natural region. Besides Algonquin Park’s natural beauty, the wildlife viewing is outstanding. Paddlers may see beavers, bears, minks, and moose feeding by the waterways. And if you like to try your hand at fishing, the lakes are the place to drop a line. There will be ample time each day to relax and explore the surrounding areas of Algonquin Park, swim, fish, or practice your paddling technique. Included: Park user fees, camping fees, cooking gear, camp stoves, tents, meal preparations, canoes, paddles, life jackets, canoe dry bags, meals/snacks/beverages on the expedition, tarps, major first aid supplies, emergency radio or satellite phone, and professional guides. Gratuities are not included. Our guides make every effort to ensure your holiday is all you expected and more. Recognition of a job well done is always appreciated. $20/day is recommended which will be divided between the guides. Meals: Beginning with lunch on Day 1 and ending with lunch on the last day. Day 0: Arrival in Toronto. Days 1-6: There will be ample time each day to relax and explore the surrounding area, swim, fish or practice your paddling techniques that our ORCA certified guides / instructors will be teaching you as we travel. We will travel through many beautiful wilderness lakes using light weight kevlar canoes and short easy portage routes. We will be camping on four to five different sites and lakes as we explore this little traveled part of the park. The wildlife and fishing here is outstanding! In the past we have seen moose, eagles, beaver, and minks to name a few. We try to be off the water each day by around 3 pm to allow every one to relax and enjoy the wilderness area we are camping in that night. We will also spend 2 nights on beautiful Misty Lake deep in the interior od the park where you get to lie back in the sun and just relax and enjoy yourself and fellow trippers in beautiful wilderness surroundings and explore. Our trips generally are back in Toronto by 6:30 pm on the last day of the trip. Toronto-Yorkdale Many major carriers fly into Toronto. Check with your travel agent for details. Public transit and taxis provide service from the airport to accommodation near our pick-up point, the Yorkdale Shopping Centre.